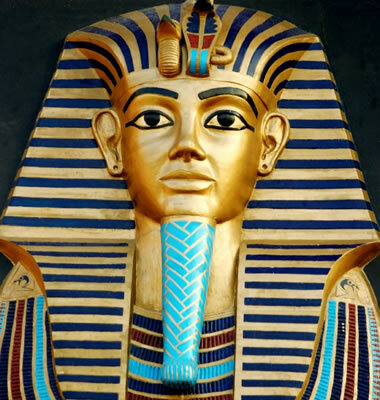 Egyptian gold: Artisans of ancient civilizations used gold lavishly in decorating tombs and temples, and gold objects made more than 5,000 years ago have been found in Egypt. Image copyright iStockphoto / Akhilesh Sharma. Gold coin: As a highly valued metal, gold was used as a financial standard and has been used in coinage for thousands of years. 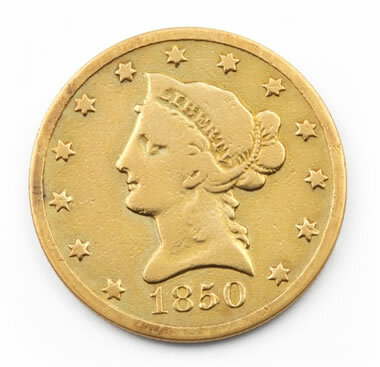 United States ten dollar gold coin from 1850. Image copyright iStockphoto / Brandon Laufenberg. Aside from monetary uses, gold, like silver, is used in jewelry and allied wares, electrical-electronic applications, dentistry, the aircraft-aerospace industry, the arts, and medical and chemical fields. 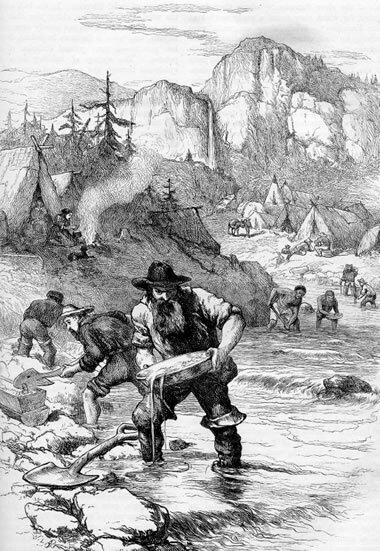 Gold rush: The discovery of gold triggered numerous gold rushes in the United States and around the world. Image copyright iStockphoto / Duncan Walker. 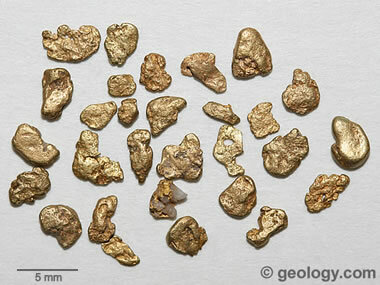 Gold nuggets: Small nuggets of gold obtained by panning. Prospectors worked stream sediments to find tiny nuggets that they would sell or trade for supplies. Nevada gold mine: Fortitude Mine in Nevada produced about 2 million ounces of gold from a lode deposit between 1984 and 1993. USGS image. Hydraulic placer mining at Lost Chicken Hill Mine, near Chicken, Alaska. 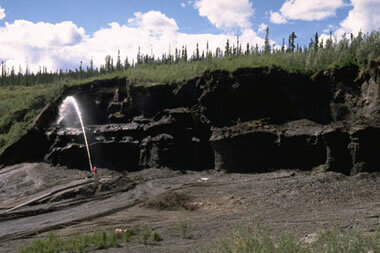 The firehose blasts the sediment outcrop, washing away sand, clay, gravel and gold particles. The material is then processed to remove the gold. USGS image. Gold sluice: Portable gold sluice. Miners place the sluice in the stream and dump sediments in the upstream side. The current transports the sediments through the sluice and the heavy gold particles become lodged in the sluice. 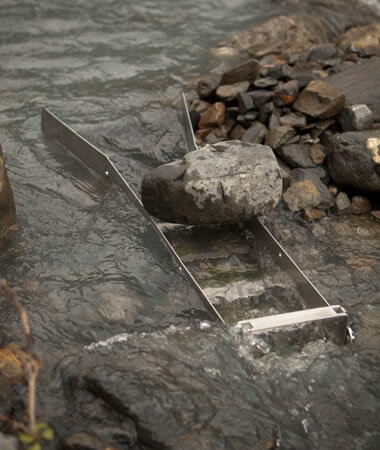 One miner can process a lot more sediment through a sluice than through a gold pan. Image copyright iStockphoto / LeeAnn Townsend. One widely accepted hypothesis proposes that many gold deposits, especially those found in igneous and sedimentary rocks, formed from circulating groundwaters driven by heat from bodies of magma (molten rock) intruded into the Earth's crust within about 2 to 5 miles of the surface. Active geothermal systems, which are exploited in parts of the United States for natural hot water and steam, provide a modern analog for these gold-depositing systems. Most of the water in geothermal systems originates as rainfall, which moves downward through fractures and permeable beds in cooler parts of the crust and is drawn laterally into areas heated by magma, where it is driven upward through fractures. As the water is heated, it dissolves metals from the surrounding rocks. When the heated waters reach cooler rocks at shallower depths, metallic minerals precipitate to form veins or blanket-like ore bodies. Gold dredge: A scuba diver vacuums sediment to be processed by a portable gold dredge. Scuba gear allows the prospector to carefully get access to cracks and crevices on the stream bed where gold nuggets might be lodged. Image copyright iStockphoto / Gary Ferguson. Gold drywasher: A portable dry washer used to sift gold nuggets from soil where water is not available. Soil is dumped into the top pan and is shaken through the bottom pan. Heavy gold nuggets are mechanically separated from lighter materials. Image copyright iStockphoto / Arturo M. Enriquez. In gold-bearing country, prospectors look for gold where coarse sands and gravel have accumulated and where "black sands" have concentrated and settled with the gold. Magnetite is the most common mineral in black sands, but other heavy minerals such as cassiterite, monazite, ilmenite, chromite, platinum-group metals, and some gemstones may be present. Looking for gold? We have over 50 different gold books and gold maps that show where gold has been found in the past and provide instruction on gold prospecting methods. Also available are gold pans in a variety of sizes and gold panning kits which include everything that you will need.